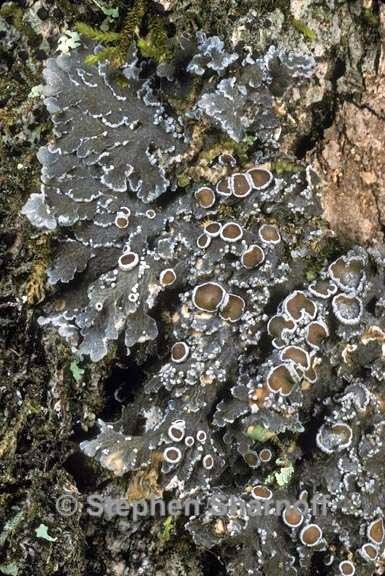 Thallus: foliose, flat, orbicular, up to 5-7 cm diam., with poorly developed hypothallus lobes: confluent, apically enlarged, wrinkled upper surface: olive-gray photobiont: a Nostoc in chains lower surface: whitish, naked, loosely attached by blue-black rhizohyphae Apothecia: mainly central, up to 2 mm wide; disc: brown, with squamulose thalline margin; exciple: paraplectenchymatous, 80-100 µm thick; hymenium: primarily hyaline but brown above, partially I+ blue (in vicinity of the asci) asci: clavate without inner amyloid apical structures, 8-spored ascospores: simple, colorless, ellipsoid 10-18 x 7-9 µm with a distinct, rugulose, apiculate epispore Spot test: thallus K-, C-, KC-, P+ orange Secondary metabolites: pannarin. Substrate and ecology: on hardwood trees, usually on oak, in warm-temperate, moist forests at middle altitudes World distribution: main species widespread in tropical regions, but subspecies quercicola appears to be endemic to the hardwood forests of eastern North America, extending southwards to Mexico Sonoran distribution: rare, only collected once in the montane region of Sinaloa, at the base of an oak. Notes: It is easily recognized on the heavily wrinkled thallus and is often found on oaks. It is similar but larger morphologically than P. lurida ssp. russellii, which occurs farther north and is usually P-.